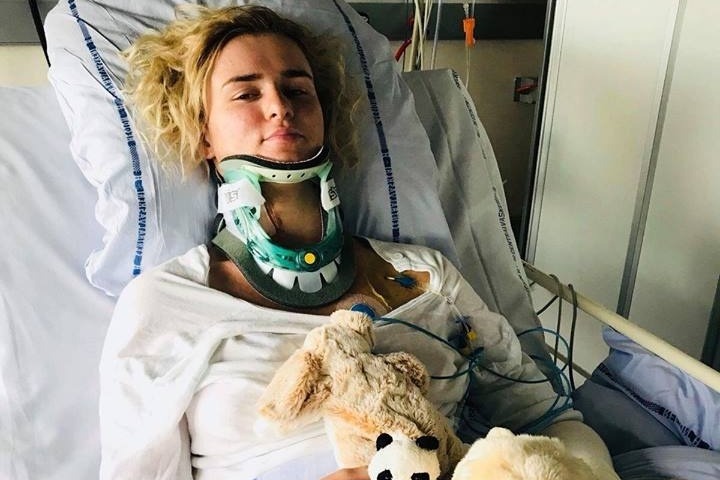 On the 1st August, Tetiana Korenieva, a professional circus artist, suffered a life-changing accident while working for Cirkus Arena in Denmark. 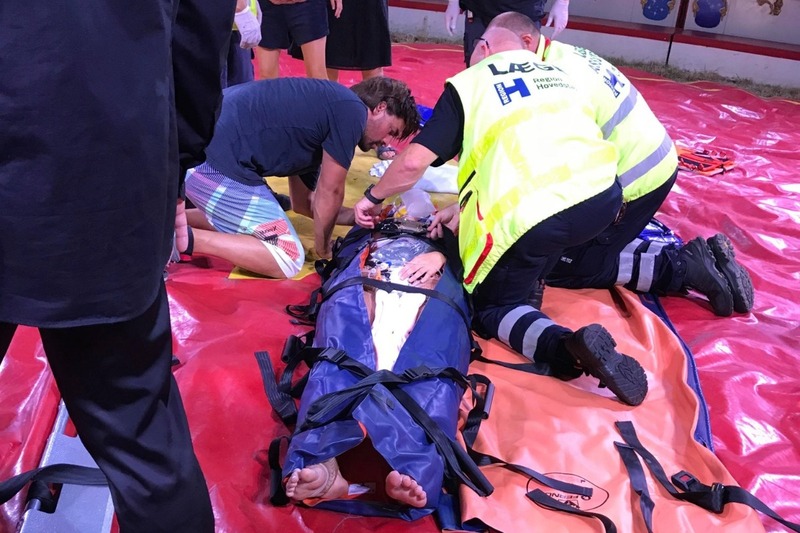 A steel cable snapped whilst she was performing suspended in mid-air, causing her to fall upside down from a height of 7-8 meters. It’s a small miracle that she survived, and has resulted in her breaking almost all the bones in her cervical spine, a shattered left pelvis, nerve damage down her left side, a vertebral artery dissection and other serious health issues. After being airlifted to a specialist hospital in Copenhagen where she underwent an 8 hour operation the following day, her condition is currently stable. Cirkus Arena is the largest circus in Scandinavia, and the accident has been well-documented in Danish media, appearing on television as well as in local and national news articles; some of which can be found at the bottom of this page. Tanya comes from a small village in Ukraine located just outside Kiev, and attended her first circus show at the age of 4 in her local theater. It was from this young age that, after having watched an aerial silk act, she became transfixed by what she saw, and her passion for performing was born. At the age of 10, she attended her first school in performance arts, and began working with aerial silks for the first time. At 18, she was accepted into the Kiev Municipal Academy of Variety and Circus Arts, where she honed her craft over the next 3 years. This would consist of 5 hours of daily practice, with 2 hour journeys each way on public transport to get to school and back. During this time, Tanya’s life was fully centered on her training, leaving little-to-no time for any extracurricular commitments. The years of hard work eventually paid off when, in 2015, Tanya successfully auditioned for and was accepted into the prestigious Bingo Circus Theatre. It was here she perfected her act and earned her first contracts, performing in France, Turkey, Ukraine and two years at Circus Roncalli in Germany and Austria, before coming to Denmark. Below is a video of her solo act, which she performed with Cirkus Arena from March 2018 until the day of her accident. At 00:35 you can view her own signature move which has since been used by other aerial silk artists around the world. Sadly, it was during this trick that the cable snapped. Her rehabilitation period will take a minimum of 12 months, during which time she will be unable to work, or find employment of any kind. Throughout this period she will be undergoing rigorous physiotherapy, ergotherapy, gym and training sessions. There is however the smallest of chances that if everything heals optimally and her therapy goes to plan, she may be able to perform as an artist again one day. This is the hope that we're holding onto. She is due another check-up towards the end of October after which, depending on the verdict, might result in further surgery and her spine having to be operated on once again. This could cost her over €70,000. Danish health insurance (there is no health & accident insurance on behalf of the circus) only covers the first few weeks of her treatment, after which all further medical needs (the possibility of second surgery, check-ups, medication, physiotherapy etc.) in the upcoming months or years, are not. 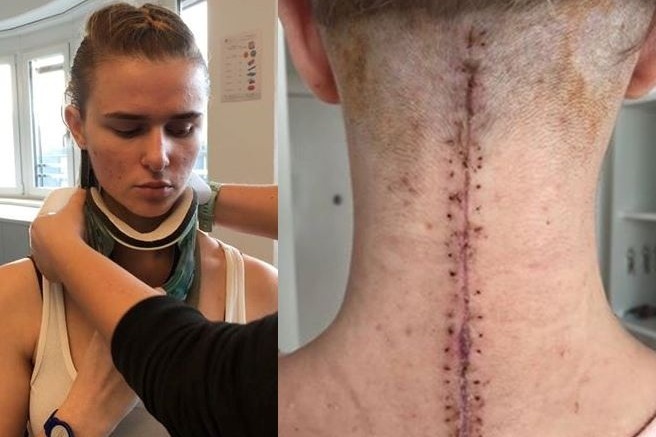 Tanya is moving to Hamburg, Germany to continue her rehabilitation, where she met her boyfriend Sebastian Hofmann during her time with Circus Roncalli. Sebastian suffered a stroke in 2009 and fought for over 20 months to gain full recovery. Due to his own experience, he has a specific understanding of Tanya's situation and is giving her all the support he can. He is already in contact with a hospital (spine center) to ensure her treatment. Tanya is 24, and the career she has trained her whole life for is now over. Her passion has become one of her biggest fears. She will never climb her silks again, and she knows that, if she were ever to perform in the future, she would have to find a new discipline and start all over. As for now, she faces an incredibly difficult year ahead, and desperately needs help. All the money raised will go towards her rehabilitation, and if it turns out that she will have to undergo a second operation in November, the need for funds will be greater and more urgent than ever. We know that €70,000 is an unbelievable amount of money to ask for, but the closer we get to our target the better Tanya's chances will be of once again living a normal life. Please donate what you can towards her cause and help to spread the message. Even €10 can make a difference. We will be keeping all donors updated on Tanya's condition, her medical expenses and overall progress. She is extremely grateful for any support you can give. And lastly, please share the link to this page and let's help Tanya dance again! We would also like to say a huge heartfelt thank you to the doctors and medical staff at Rigshospitalet København and Slagelse Sygehus for looking after and taking such excellent care of Tanya. If it weren't for their help and quick thinking, she might be a lot worse off. It is thanks to them that she at least now has a fighting chance of going back to living normally again, and for that we will be forever grateful. Tanya started with her full-time rehabilitation in a specialized rehabilitation and recovery center. 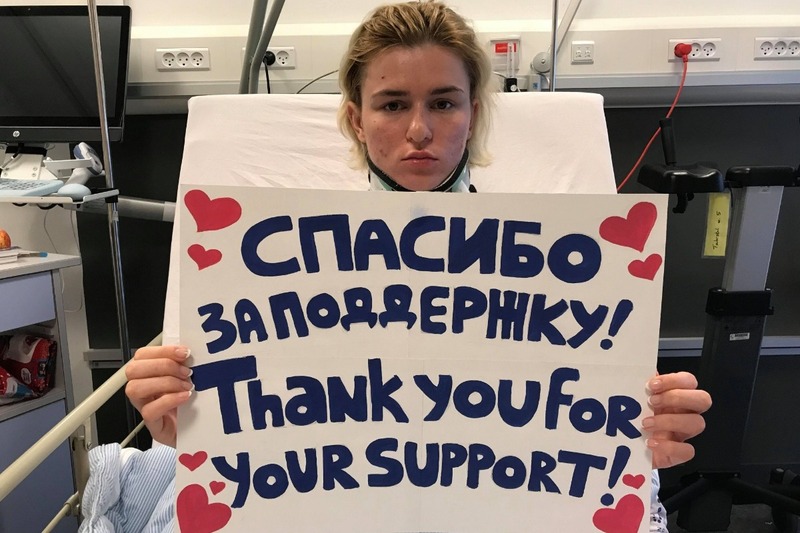 Since her accident on the 1st of August, today was the first time that Tanya could take off her stiff-neck (Cervical Collar). After over 100 days wearing her stiff-neck permanently 24/7 she could finally take it off for a few minutes. It will take her at least weeks of intensive training to be able to life without wearing her stiff-neck. Tanya`s long rehabilitation process just started and there is still a hard and painful way ahead of her. Tanya`s second spine surgery went according to plan and without major complications. Almost all bones in her neck (cervical vertebrae) had to be surgically treated. Because of that nearly the entire mobility of her head and neck is now forever blocked by implants. Tanya still has major sensitivity disorders and a partially paralyzed left side. She still suffers massive pain (neuropathic and nociceptive). Due to her broken vertebral artery, broken left pelvis and some other serious health issues Tanya needs a lot of further medical check-ups and treatments from various doctors (pain-therapist, neurologist, etc.) in the upcoming months. Tanya`s health situation also requires a permanent intake of medication in addition to her painkillers. As soon as Tanya's situation permits, she will be transported to a full-time rehabilitation in a specialized rehabilitation and recovery center. 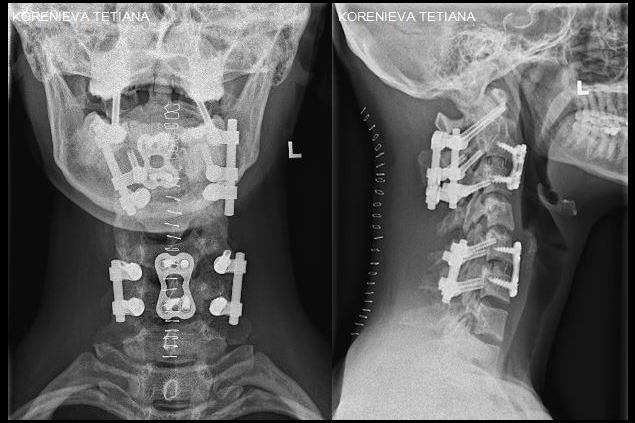 Tanya's neck is now stabilized by 18 screws, 4 rods and 2 plates. Unfortunately I have some sad news today. Tanya needs a second spine surgery! After thorough radiological examinations and consulting different specialized doctors (orthopedic and neurosurgical), it is now 100% certain that Tanya requires further surgical treatment to her cervical spine as soon as possible. We are already in contact with a hospital which has the necessary specialization and experience to carry out such a rare, complex, profound and risky surgery. Sadly, after the spine surgery Tanya will never be able to move her head and neck like a healthy person again. How far her mobility will remain impaired can only be told after months of daily therapy and rehabilitation training. Right now we can only cross our fingers and pray that her surgery will go well since there are some serious medical risks involved in a cervical spine surgery like hers. Finally, I would like to once again thank all of you for your kind help and concern for Tanya’s situation. If you could please help to share, contribute and spread the word about Tanya’s cause, it would mean the world to her. I am happy to bring you the first update on Tanya’s current condition. I would like to start by thanking each and every one of you for your donations. You are incredible! It is caring people like you who are ready to stand up, help and bring hope to others in times of need. I sincerely thank you for the help you have given to Tanya. Tanya is slowly getting better. As some of you know, she was recently transported to Hamburg, Germany where she is currently staying with me whilst receiving daily treatments from spine specialists (physiotherapy, ergotherapy etc.) followed up by medical check-ups. It has been almost two months since her accident and she is now starting to move around very slowly using crutches. After 6 weeks of daily physiotherapy and ergotherapy, she is gradually regaining some mobility/sensibility in her left side. Tanya is still suffering tremendous pain and finds it very hard to fall asleep at night. Ever since we started fundraising I have been reading her the kind messages and comments of hope that you have been sending to her. She adores listening to them and it helps her to deal with this terrible situation. Obviously there is still a long way for her to go! Tanya’s rehabilitation will take at least another 11 months and there is still the possibility of another surgery. Throughout this time, it would help her so much if you can help to spread her story even more, letting people around you know that you yourselves have helped to bring Tanya’s life slowly back to normality, and that they can help too. I will write another update as soon as further news emerges and please don’t hesitate to ask me any questions. Thank you once again for everything you have done for her so far. More people like yourselves are needed in this world! Tanya will never forget your kindness and generosity. To her, you are like guardian angels, and it is good to know she has so many looking over her.